The Niners landed Notre Dame tackle Mike McGlinchey Thursday night in the 2018 NFL Draft, continuing the foundation of an offensive line they hope will only get better in 2018 and beyond. 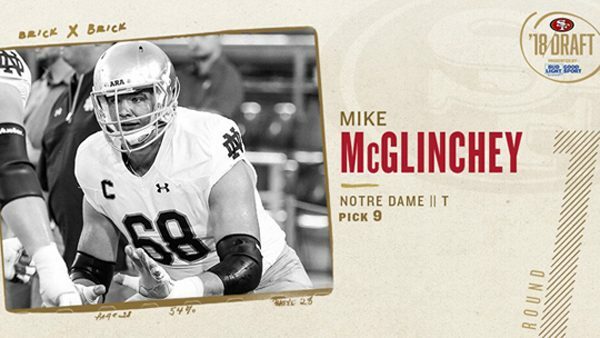 The #49ers take stud #ND OL Mike McGlinchey at No. 9. If they hadn’t, Oakland likely would’ve. With the ninth-overall pick in the 2018 NFL Draft, the San Francisco 49ers selected Notre Dame tackle Mike McGlinchey. McGlinchey’s stock has risen over the last 48 hours as he emerged as the consensus top tackle in this year’s class. 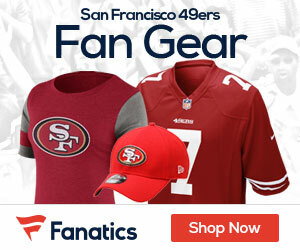 With the pick, San Francisco has now acquired the heir apparent to Joe Staley. Be the first to comment on "49ers Land Notre Offensive Tackle Mike McGlinchey in First Round of NFL Draft"